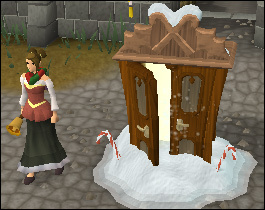 It's Christmastime again in RuneScape, and this year the Queen of Snow has invited guests to her own Christmas feast. However, Ebenezer Scourge, a neighbor of the Queen of Snow, has decided to wreak havoc on the party, and the guests are in trouble! Can you save the party before it's too late? Note: This event was only available from 21 December 2009 until 4 December 2010. 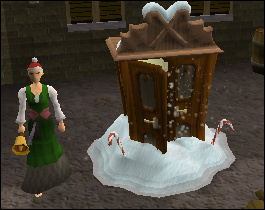 Enter one of the Christmas Wardrobes in Draynor, Varrock, or Falador. 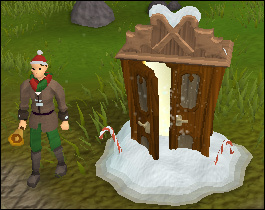 To get to the Land of the Snow you will need to go through a Christmas Wardrobe in Draynor, Varrock, or Falador. You will learn when you arrive from a Partygoer that Ebenezer Scourge is the one responsible for stealing all the food of the feasts, and kidnapping Santa. You are then told to talk to the Snow Imps who are investigating. 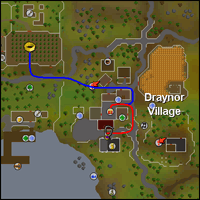 The imp you need to speak to is near the fountain, on the southern end of the area you are in, and if you have played RuneScape in prior years is the same imp whom you have helped before. 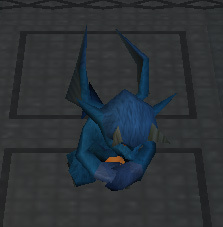 Each imp has their own name, and different players can have differently named imps. When the imp asks for help, reply "Count me in", and travel to the house to the East. 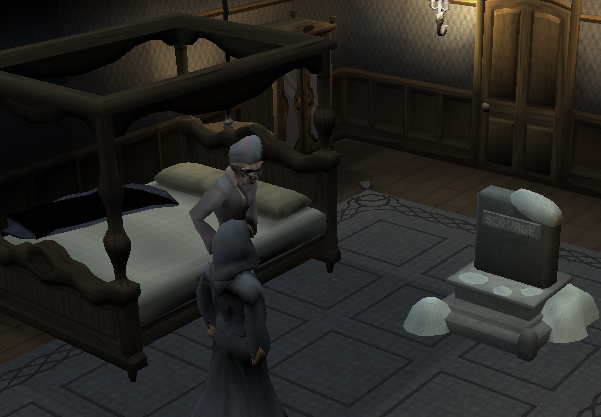 Now talk to Ebenezer Scourge who lives in the house. You can find him in the room west of the entrance. He may be under several hundred imps, which can make him difficult to find. When you speak to Scourge you need to ask him "Why did you ruin the Queen of Snow's feast?" and tell him "We're here to ask you to release Santa" and of course he's going to extraordinarily arrogant. You're imp will then tell you the new plan is Ghosts! Time for the item search, seeing as it's random for everyone check every barrel, wardrobe or any other places you can search on the ground floor of the house for Chains , A needle, Thread, and Bedsheets . 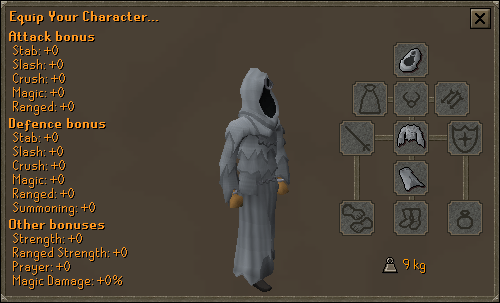 Once you have these items, use them to make a "Ghost Costume" . Now your imp will tell you that you need to find out about Scourge's past, specifically a mistake he made. Now who might know about a mistake? Well go talk to the Queen of Snow, you can find her back at the party under the tent on the northern end. 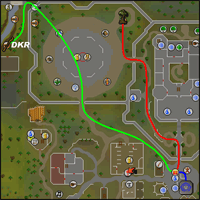 You will most likely have to right click as other users seem incapable of keeping their Snow Imps from blocking her from view. 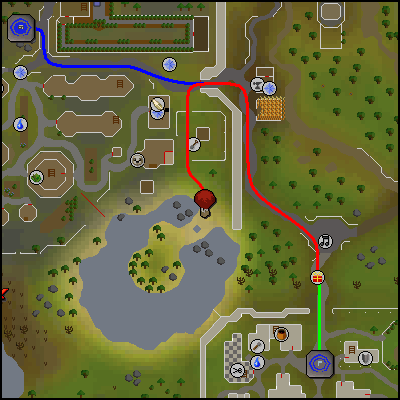 The Snow Queen will tell you that Scourge and her had once been in love, but he had returned to Gielinor. In the time he was gone the Snow Queen learned that he had become evil, and had met jolly old St. Nick and fell in love with him. When Scourge returned and learned that he couldn't have The Snow Queen back he swore vengeance, and just recently returned. The Snow Queen believes this is his vengeance. 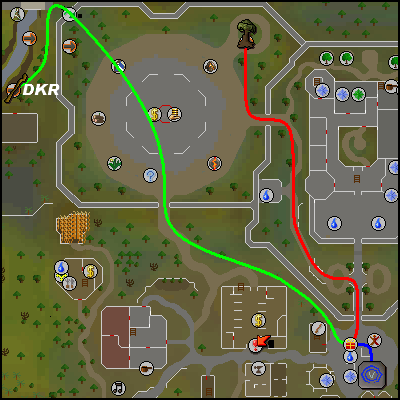 Return to Scourge's house, disarm yourself, otherwise you won't be able to progress. Now climb up the stairs and a cutscene will play. Choose the first option: "I am a ghost"
Choose the second option referring to chains: "The weight of my sins"
Choose the second option: "What about betraying the Queen of Snow?" Now guests at the party will be caught in a fire, a total of six, and Scourge is blocking the Queen of Snow's magic so it's up to us. The order is random for each person therefore I advise having either a program like Notepad open, or a pen and paper, or a camera. The six guests are General Wartface, General Bentnoze, Partygoer, Tiny Thom, Cook, and Sir Amik Varze. Free them in the order that is the reverse of the Red Sparks when the curse is set or reset. Use buckets on the fountain on the southern end to fill them with Icy Water. 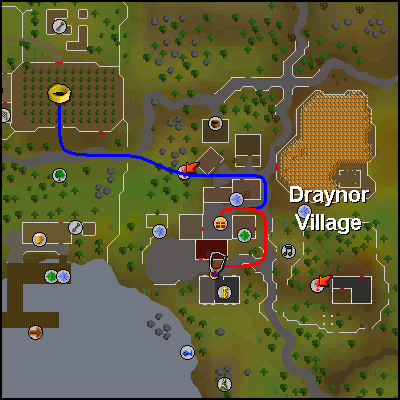 Use the Icy Water on the people trapped in the flames. If the curse does not reset, you will get both a cutscene and a message warning you if it does, add the name to your list, so you can count the order you have correct. Continue until you are able to complete your pattern and free all of the guests. Your snow imp will tell you that you can use this spoiled brat to show Scourge the error of his ways, and now it's time for the Ghost of Christmas Present to make a stage appearance. Choose the second option: "Not until you have seen what I have come to show you"
Choose the second option: "Tiny Thom"
After you choose Dramatic Point the Snow Imp will summon up a tombstone with Scourge's name on it which seems to shock him. After this Scourge will free Santa and return the food. 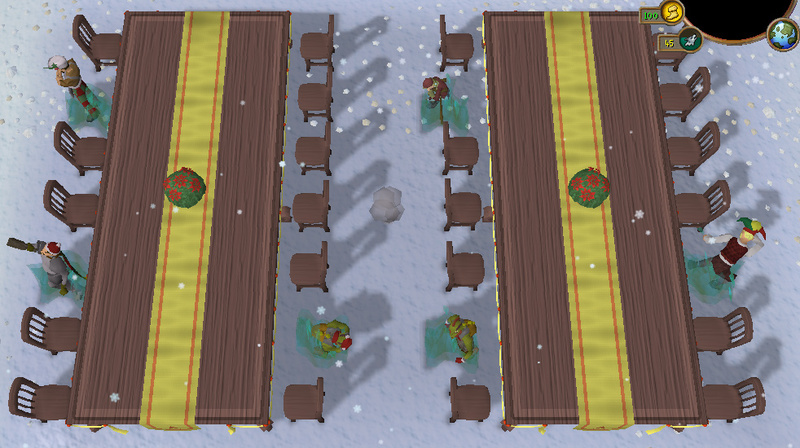 Now go and talk to Santa Claus, on the northern end of the Feast tables, close by the tent who will tell you that he left a present for you and your Snow Imp underneath the tree. Go over to the Christmas Tree on the southeastern end and open your present. 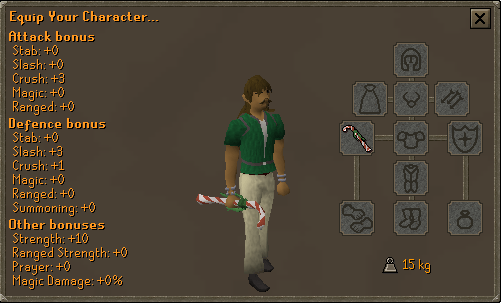 The Candy Cane has an emote isolated to the item, "Spin", which allows you to throw it in the air and catch it, at the moment there is also a glitch if the Candy Cane is in the air and you switch the item you are wielding. For members with the Camulet Amulet there is an amusing conversation with Maurice the Camel. 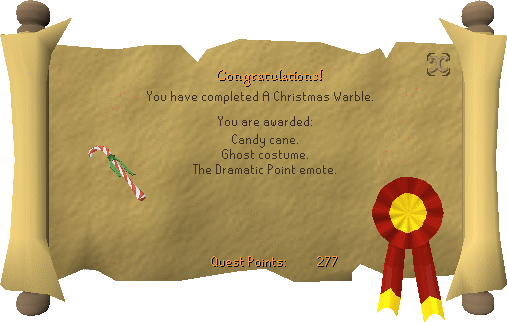 If this is your first Winter event, you will unlock all prior Winter emotes as well.